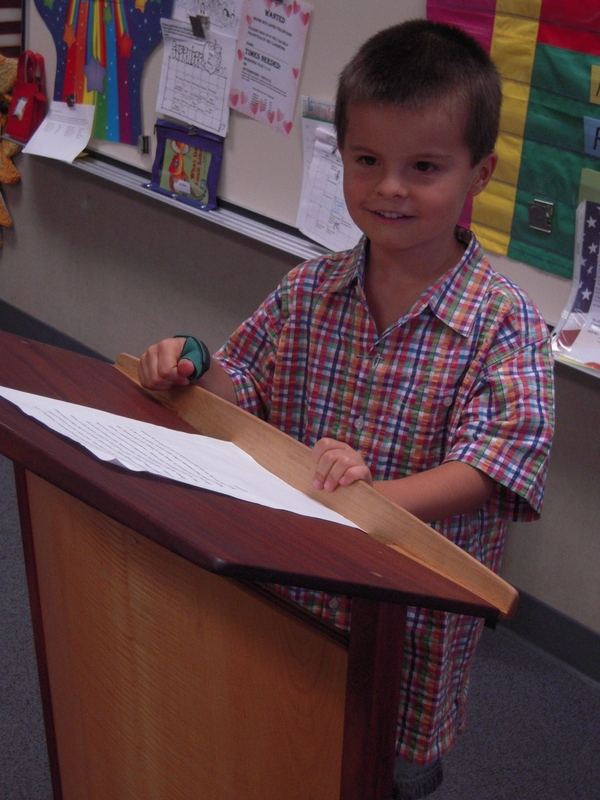 There’s my boy, giving his student council “vote for me” speech (results tomorrow – EEEK!). Never mind the safety pin on the shirt, the splint on the thumb, the shorts and tennis shoes – isn’t this the face of the future? C for President 2036! C had a rough start yesterday morning, and on those days I try to go in and have lunch with him. Truthfully, I probably get more out of it than he does. I feel like the Pied Piper as the kids follow me around, each clamoring to sit with C and his Mom at lunch. They pepper me with questions about C. “What kind of pajamas does C wear?” “Does he have his own room?” “Does he have brothers and sisters?” I try to get them to direct their questions at C, but he is sometimes so overwhelmed by lunch itself that he is staring off in a daze. Even if he could answer all the questions, they come with such speed I can barely keep up myself. “Mrs. P!” “Mrs. P!” “C’s Mom!” They are tapping me on the shoulder and doing their best to get my undivided attention. You’d think these kids had no parents, no one in their lives. They seem starved for adult focus and attention, which I know is not the case. I suppose just the novelty of a new person around for lunch is pretty exciting to them. I can’t even quite figure out why having a parent around is still socially acceptable. When C had days last year where he would bring home a mostly full lunchbox, I threatened to come in and sit with him at lunch so that he would eat. “Cool,” he said. Oops. I guess in 2nd grade, parents are still sort of interesting, and I want to do my best to be the cool Mom in the hopes that some of their curiosity and fondness will be turned in C’s direction. For one brief moment, it’s all about C, they all love him, and he is the coolest kid in class.